I know what I am doing this Taco Tuesday!!! Who's coming to join? Seriously though these steak tacos were really easy and quick to make. The cheese shells were on point and were just like regular taco shells. Next time around I am thinking about turning this dish into nachos!! Preheat oven to 375°F. Line a sheet pan with parchment paper or a Silpat. Set out four glasses that are similar in height and rest a wooden cooking spoon over each pair of glasses. These suspended spoons will be used to shape the tortillas. Divide cheese into three mounds on top of lined sheet pan. Use hand to flatten and spread cheese into circles spaced 1-2 inches apart. Bake for 10-15 minutes or cheese appears lacy and is golden-brown on the edges. Use a spatula to carefully drape tortillas over suspended spoons to create tortilla shape. Allow to dry and harden. Meanwhile, sprinkle taco seasoning over both sides of the steak. You may not use the whole packet. Preheat a grill or grill pan to medium-high. If using a grill pan, melt butter over the top and allow to brown slightly. For medium rare or medium steak, cook for 2-3 minutes. Rotate steak 90 degrees using a fork, and cook for an additional 2-3 minutes. Flip steak with a fork, and repeat process. Remove steak onto a plate and allow to rest for 10-15 minutes, before slicing into thin strips against the grain. 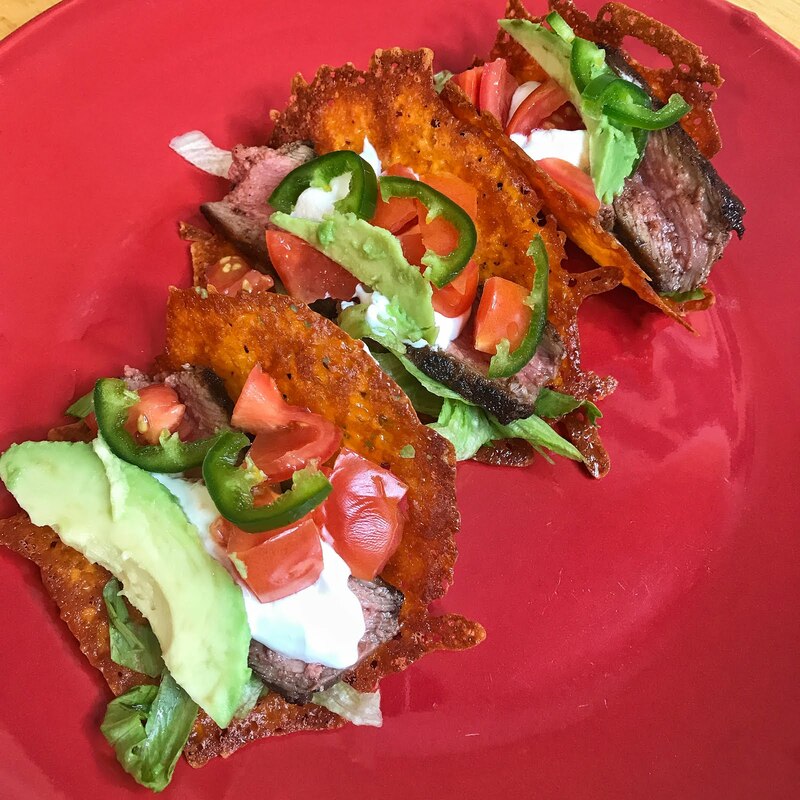 To assemble, fill taco shells with a pinch of lettuce, a few strips of steak, a dollop of sour cream, a smattering of diced tomato and avocado, a few thin slices of jalapeño.